Add effortless everyday glamour to your wardrobe, with this feminine pair of 9ct white gold pear shaped drop earrings showcasing diamond cut cubic zirconia stones for ultimate sparkle. 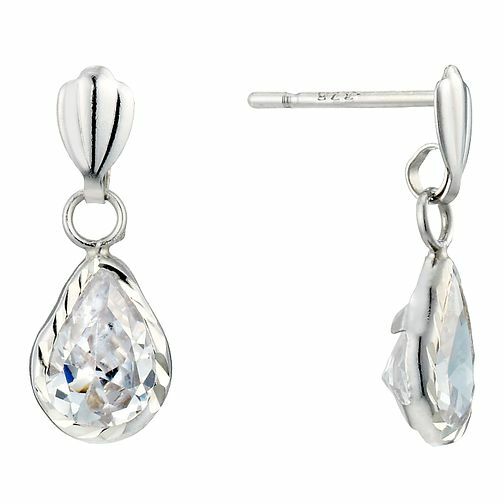 9ct White Gold Diamond Cut Cubic Zirconia Pear Drop Earrings is rated 3.8 out of 5 by 11. Rated 3 out of 5 by Anonymous from Great but now unable to wear Purchased as a Christmas present. They are very nice earrings, small and easy to wear. Only problem is that on day 5 of wearing them the back has fallen off one and other backs that my wife owns do not fit. Rated 4 out of 5 by Anonymous from Christmas earrings Although loved on initial inspection, the butterfly clasp and post are tiny and appear to be loose. Found one on floor today, so disappointed.